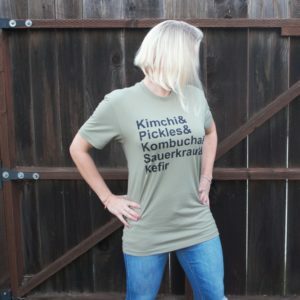 Kimchi is so more than just cabbage! 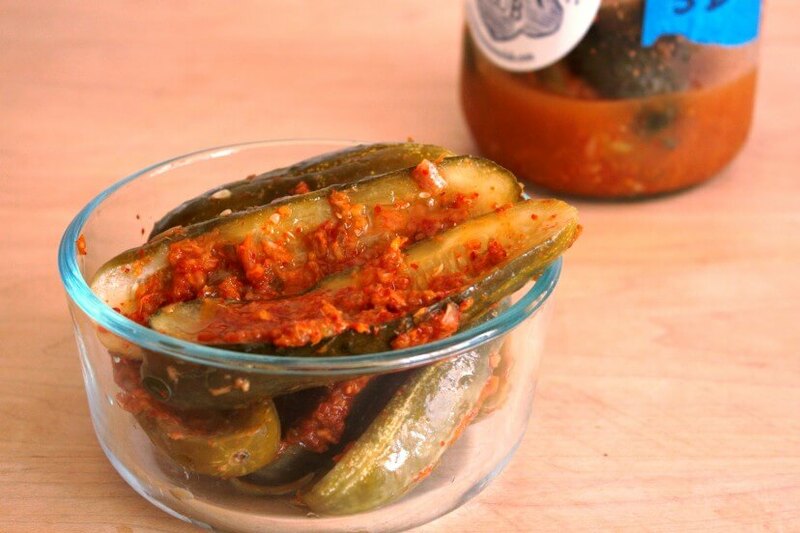 There are almost 200 varieties of kimchi in Korea. 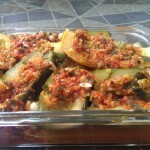 This dish uses cucumbers, a summer fruit. It has a clean, refreshing taste (no fish products are used so it is also vegan), and ferments rather quickly– in as few as 2 days! It is also perishable (only lasting a week or so), so it is recommended to only make as much as you plan to consume in that time. 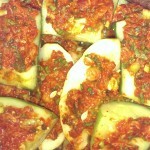 Slice cucumbers into halves, then into 3 inch (8cm) pieces. Dissolve two teaspoons salt into water in a mixing bowl. 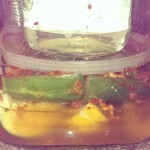 Add cucumber slices to brine. Let sit for 2 hours. 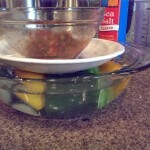 Weigh a plate on top to keep cukes submerged in the brine. Peel ginger (using a spoon) and roughly chop. Add to bowl of a food processor. If not using food processor, mince the ginger and add to a bowl. Peel and grate the garlic and roughly chop. Add to bowl of a food processor. If not using food processor, mince garlic and add to a bowl. Chop the scallions into ¼" slices. Add to food processor. 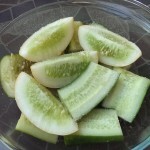 If not using food processor, slice into thinner (1/16") strips and add to bowl. Add pepper powder and 1 teaspoon of salt to mixing bowl. Pulse together to draw some of the liquid from the scallions, or muddle ingredients together into a thick paste. 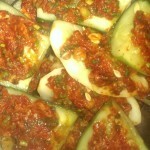 Spread a layer of paste on top of a cucumber piece. 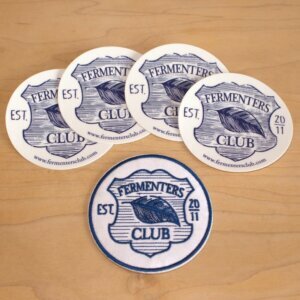 Carefully place it into a fermentation jar or crock. Repeat with the other slices. 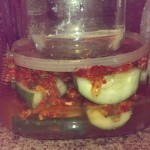 You can stack one layer on top of the other, alternating the direction of the cucumbers, to make them all fit. 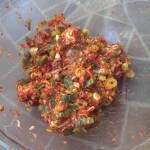 Pour ¼ cup of the brine into the bowl you used to make paste, in order to get every last morsel of paste. 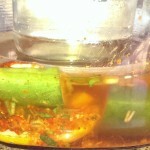 Gently pour the brine over the top of the cucumbers. 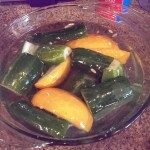 Brine should come just slightly below to the top of the cucumbers. 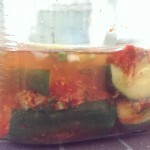 The kimchi should express more brine after the first day. After 2 or 3 days, move to the refrigerator. They will last up to 2 weeks in the fridge.